The foodie scene in Tacloban City is underrated. 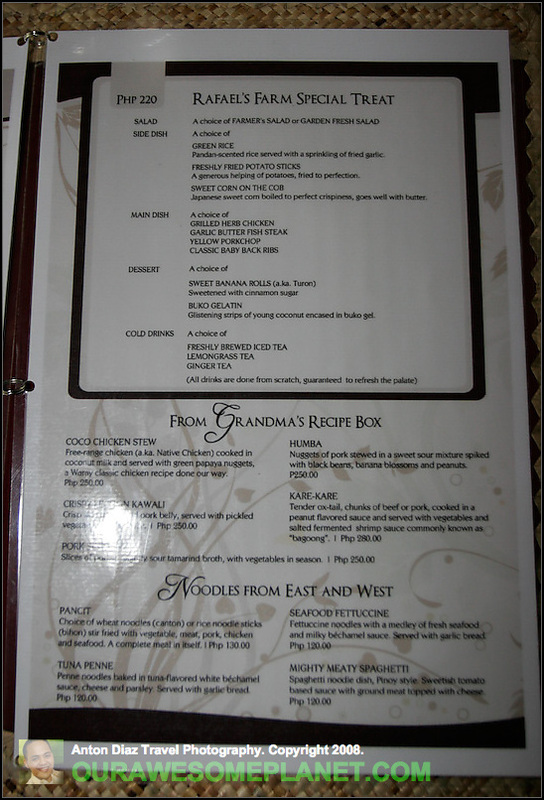 Most people think that Guiseppe Italian restaurant is the only exciting foodie place in the city. 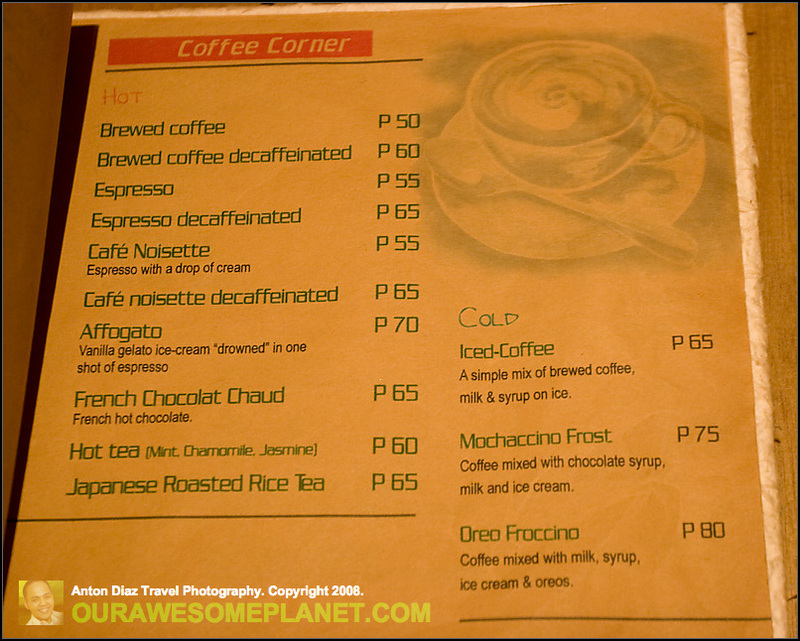 I was so excited to explore the different flavors of Tacloban. I'm planning to share it with people via a Food trip/ Heritage/ Sangyaw Festival Tour of Tacloban next year. In the meantime, let me share with you the top 10 foodie secrets of Tacloban. 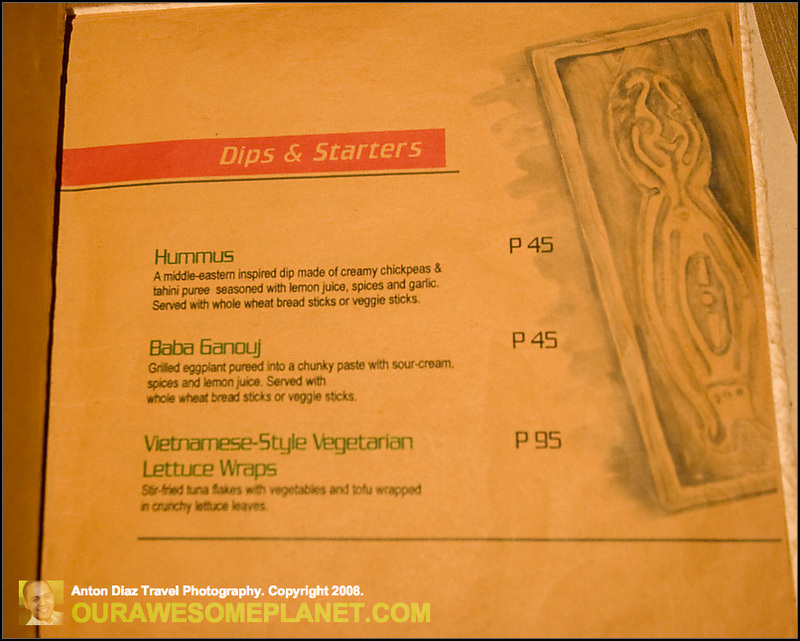 Rafael Farms is a cross between Sonya's Garden in Tagaytay and The Farm @ San Benito. Named after the adopted son (or grandson) of entreprenuer Rene Tampi, Rafael Farms is my vote for the best restaurant in Tacloban City. 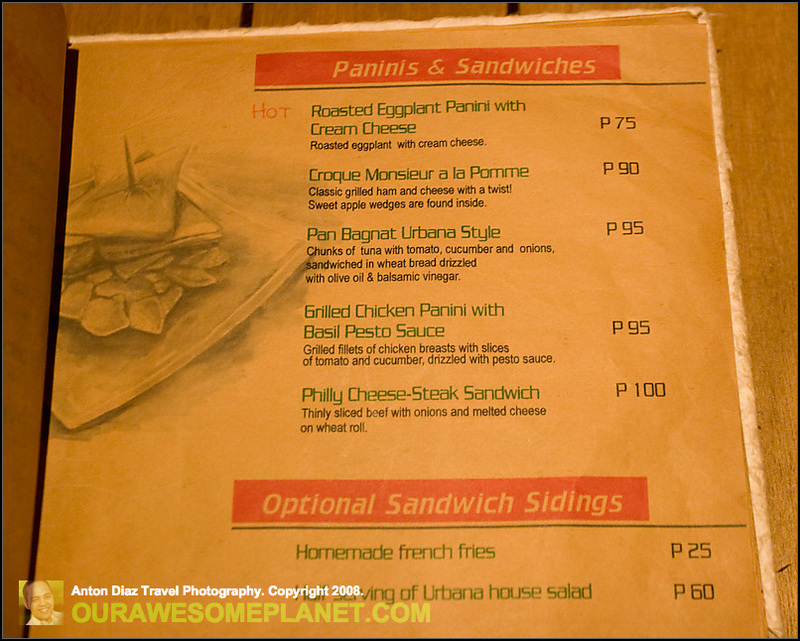 Rene started with a restaurant in Tacloban called "Join Us". It is a favorite meat place in the city and popular for ready-to-cook food and supply of meat. A set menu only costs P220 which gives you a choice of salad; a side dish of green rice, potato sticks or sweet corn; a main course of pork, chicken, fish or baby back ribs, dessert and drinks. 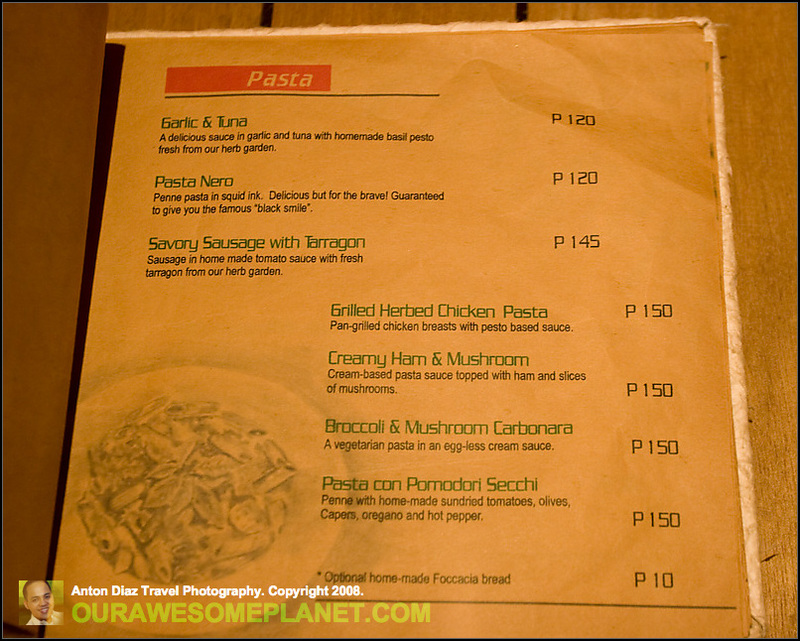 In Manila, P220 is the average cost of one gourmet dish. 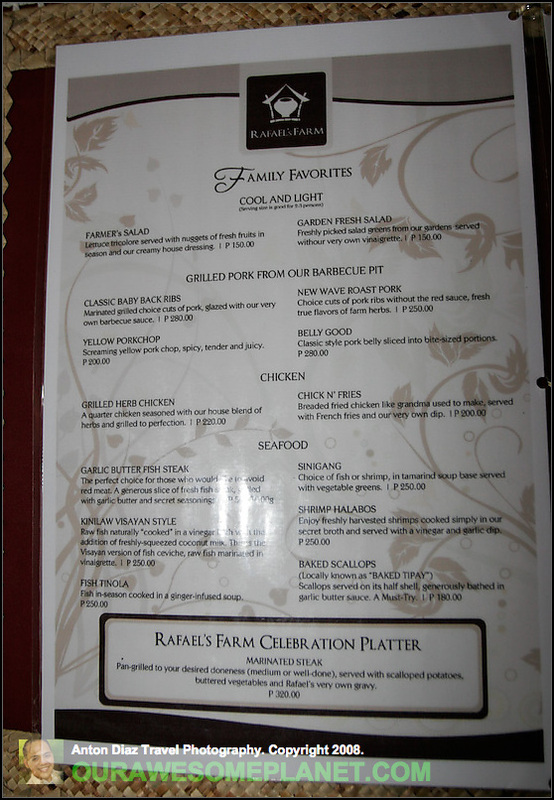 Check out the rest of the menu @ Rafael Farms. Family Favorites: Cool and Light, Grilled Pork from our Barbecue Pit, Chicken, Seafoot, Marinated Steak. You can conveniently visit San Juanico Bridge which is only approx. 20 minutes from the farm. Inside the main dining area, the ambiance is characterized by crocheted tablecloths, wooden/ garden chairs, seats covered with banig, and artwork-for-sale all around the dining area. I would also recommend the big servings of Halo Halo ala Rafael Farms for merienda! 2. Rizal Avenue Barbecue Stalls and Aling Manang's Native Chicken. If Bacolod is Manukan country, Tacloban is Barbecue country! Eating barbecue at night is an experience you shouldn't miss. There are two recommended barbecue places to go. First, is the Baldevia Siblings's Barbecue stand along Rizal Avenue near the Tacloban Market. They use a special kind of marinate for their barbecue which is served with a special kind of vinegar. I have eaten in the RTR plaza, or the barbecue places near the bay, the Baldevia's barbecue stands out to be the best. Second, I would recommend Manang's Native Chicken barbecue stand. You can see Manang's stall along Justice Romualdez at night. She serves a special kind of native chicken barbecue that only she can provide. Don't miss to eat these Tacloban longganiza. It is sweeter and more meat than fat. Cristina Gonzales would probably agree that this is the best fresh seafood restaurant place in Tacloban. Eating baked scallops is one of the guilty treats when you visit Tacloban. Ocho grill is a modern seafood paluto restaurant where you order from a fresh display of seafood and specify how you want it cooked. Don't forget to order the fish skin chicharon that I've only seen in Ocho grill. 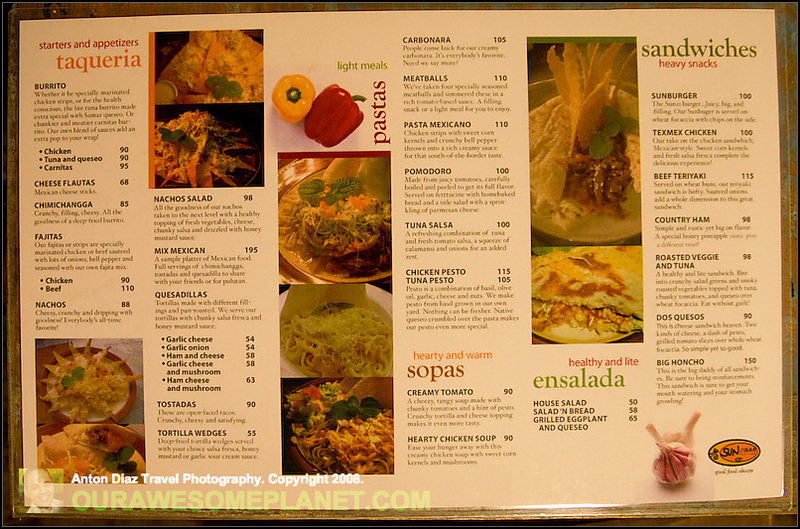 Mayanne Wenceslao's Sunzibar is a cozy secret mexican restaurant in Tacloban. 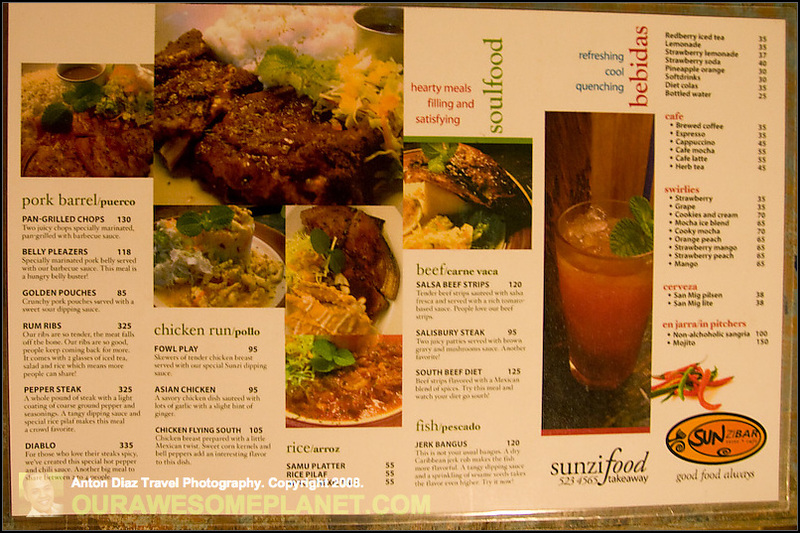 Sunzibar is famous for their nachos and rum ribs. They are proud of home-made fresh ingredients they use for their dishes. Nachos (P88). Chessy, crunchy, and dripping with goodness! Everybody's all time favorite! Rum Ribs (P325). "Our ribs are so tender, the meat falls off the bone. Our ribs are so good, people keep coming back for more. It comes with 2 glasses of iced tea, salad and rice which means more people can share"
It is almost a hole-in-the-wall restaurant and there is some kind of thrill in finding this resto. I was pleasantly surprised to find a modern cafe restaurant that serves filipino and french fusion at less than P200 per meal. Jitka with her french husband, decided to setup the cafe to cater to the local urban crowd and occasional tourist. 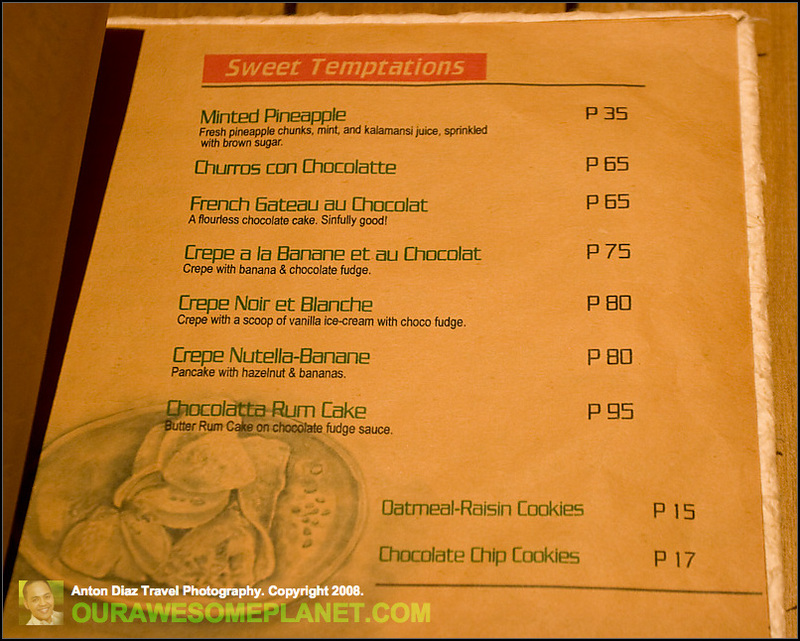 If you are looking for a dessert place in Tacloban, try out their flourless chocolate cake or their french hot chocolate. 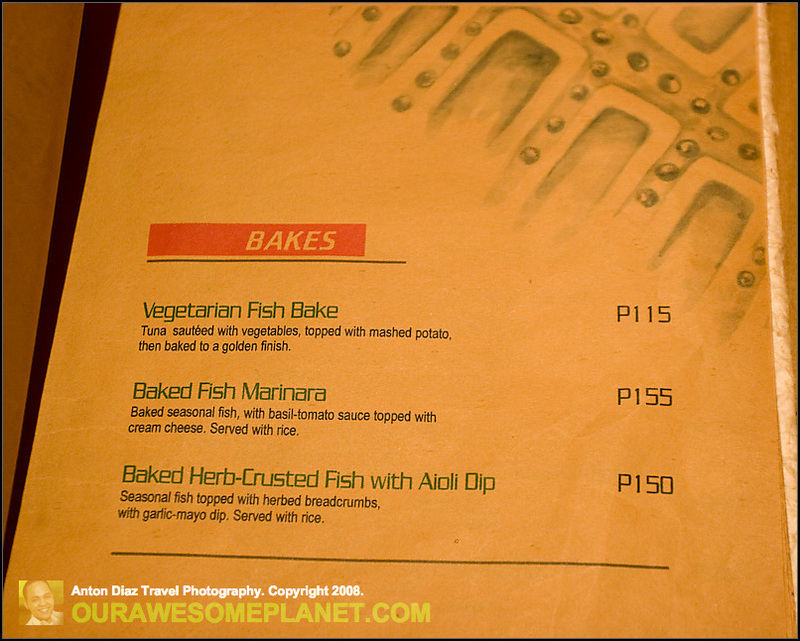 Baked Fish Marinara (P155). Baked seasonal fish, with basil-tomato sauce topped with cream cheese. Served with rice. French Gateau au Chocolat (P65). A flourless chocolate cake. Sinfully good! wow. thanks for this post, anton. 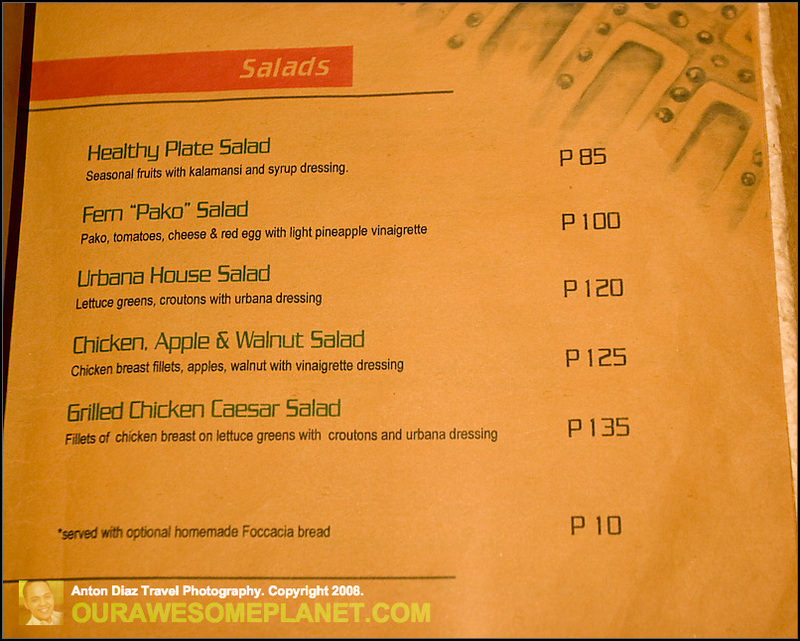 when we went to Cebu last year we were so excited to see how cheap the food was (compared here in Manila). Is it the same there? My friend recently relocated to Tacloban for a year, hmm.. maybe i should go visit. =) Thanks for sharing, Anton. Thanks Anton for the tips! I will be going to Tacloban City sometime in the 4th quarter of the year and oftener after that. Can you recommend a good hotel there? Anton, thank you so much for this. This is what is missing on the internet LOL Of the 5, the only thing familiar to me is the barbecue stands. Everything else came to life when I was already gone. I actually grew up pretty close to those stands because we had a bakery behind them, making me immune to the smoke of it all. It made looking after the bakery fun because if we wanted to eat barbecue, it was only a few steps away. The lady in the photo actually looks familiar. Yes, their marinate is so good and they actually make a sauce based on it which you can ask for extras. Did you try eating it with “puso” (rice)? Manang’s native chicken stall is also part of my childhood memories. Its one of the best go to place late at night. I agree shes the only one who makes these. If my father is craving for some native, this is the only place to go. I should really visit Ocho since my cousins actually ate kangkong from there and they usually dont get kangkong. My father is right, I am going to get lost when I go home. Better go to Ayo too, I hear the owner who owns it owns Sunzibar. The food is sort of similar, as with presentation and the ambiance, but I’d choose Ayo over Sunzibar in a quick second. Nevertheless, if you fancy fresh seafood cooked perfectly that also brings the bang to your buck, Ocho might just be the perfect alternative. In the years I’ve been coming back to Tacloban for the holidays, there always seem to be new good restaurants sprouting around the corner. After all, Taclobanons know good food. Also, the only restaurant over there that really knows a thing or two about Italian food is undoubtedly Giuseppe’s. Although it’s not in league with the other higher-end restaurants here in Manila that dish out Italian food, it’s probably the only place I can go to and feel like I’m somewhere in Makati. While it surely is no Italianni’s or Grappa’s, the great thing is, it’s way way cheaper. And you’re right Anton, I wonder why people actually think that only the more affluent Taclobanons get to dine in Giuseppe’s. It’s not expensive at all compared to restaurants in Manila. 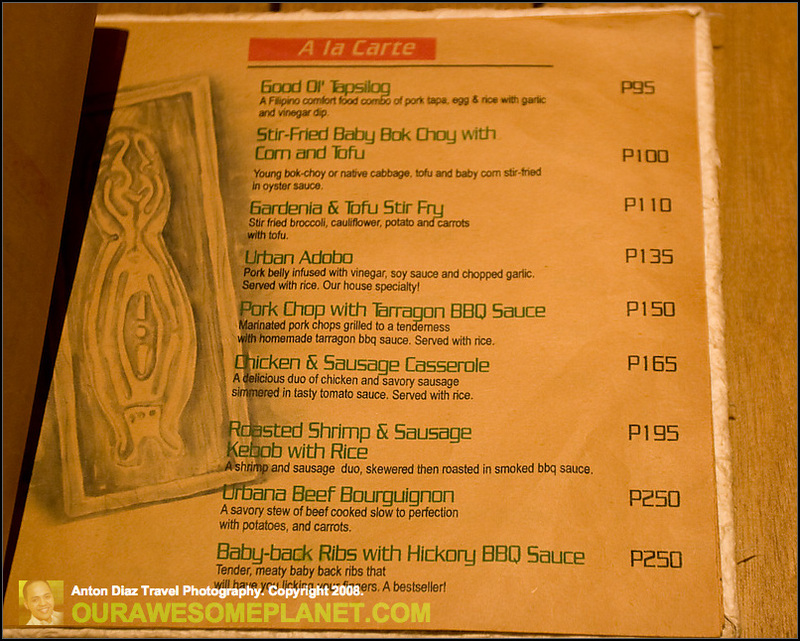 200 – 300 pesos for a swordfish dish or steak isn’t exactly a steep bargain. I can’t exactly recall but the most expensive dish there tops at 600 bucks. T.G.I. Friday’s packs a more potent punch with their 1,500Php prime rib slab. Giuseppe’s really isn’t all that bourgeois. So I’m not really sure what the hype is all about. ryan, dati akala ko rin mahal na mahal na ung presyo sa Guiseppes kasi it costs around Php200. Sa probinsiya kasi, mura lang pasahod. Now, that I’m based in Manila, I’ve come to realize na hindi naman pala siya ganun kamahal sa bulsa kung kumikita ka ng sahod na tulad dito sa Manila. i got even more excited after reading your blog! im going home this august. and dami kong gustong puntahan! 🙂 i used to take the places for granted, kasi tagadoon lang ako. pero after being away for years, i realized that leyte (and samar na rin) is beautiful. im going to revisit these places! where can i go for a great kinilaw? hello anton maraming salamat for this site . it’s a big help for me to see where i can get a good and fine dinner . may 2009 i am comming to tacloban to visit my gf so now i know where i can take here out to dinner 🙂 again maraming salamat and keep up the good work i looking forward to the other 5 places .and i hope that u know a few things that i certainly need to visit . tnx for this info, our barkada is planning a backpack trip to tacloban and we’re wondering what’s in tacloban that will make this trip exciting, yeah foodie is the one most important item in our agenda. Can u also suggest to us tourist destinations and affordable hotels? anyways… super thanks for the big help Anton!!! Thank you for this–makes me want to visit Tacloban. I love the way you can manage to make others look at Philippine destinations in a different light. I noticed this site is very outdated. Undoubtedly, many people are aware that the city was virtually destroyed by super typhoon Haiyan (Yolanda, locally). But amazingly, it has come back with, well, a vengeance. One of the most amazing aspects of the comeback is the culinary comeback. Most of the restaurants listed on this page have come back, with the exception of cafe Urbana. 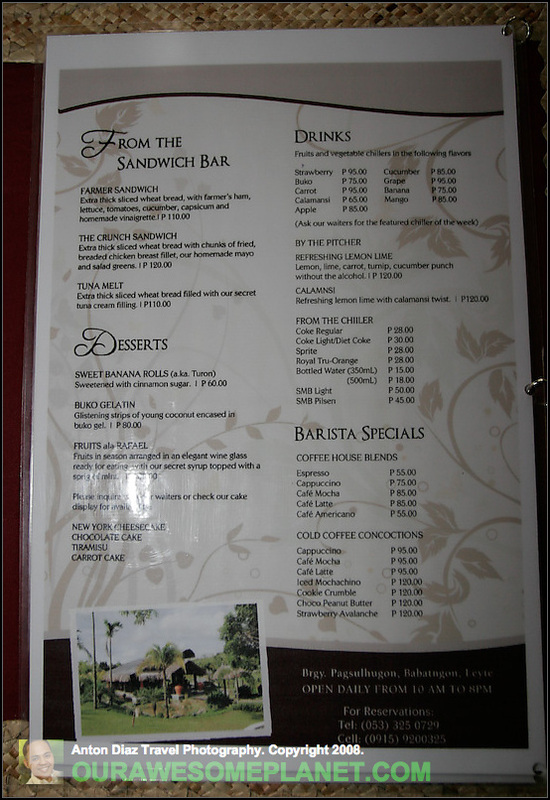 But there are now many, many wonderful culinary enterprises in Tacloban City as never before. To name a few, there’s White Spice, Chew Love, Uncle Sam’a, Mex’Em Up, K Patisserie, Rustic Coffee, Z Cafe and Betty’s. Surprisingly, Rustic Coffee is not just a coffee shop but makes the best (in my opinion) pizza and Italian pasta dishes in the region. Blows Guiseppe’s completely out of the water. And White Spice has some of the best BBQ ribs (American style) in the province. You should revamp this site, it’s a good idea. Have a nice day.